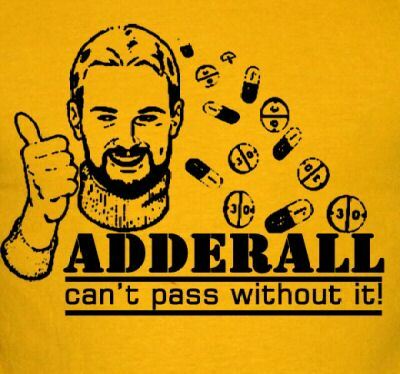 Adderall and Ritalin, or "Smart Pills" as I like to call them, are the abused drugs of our generation. The 60's had Acid, the 70's had Weed, the 80's had Coke, the 90's had Ecstasy and the New Millenium has ADD Meds. In college, theses drugs are abused constantly. A recent conversation with a fellow student before taking an important exam definitively hammered this fact home for me. "I took THREE Adderall yesterday and have stayed up all night studying for this test", he said to me with eyes so large they made him look more like an owl searching for its next meal then a student ready to "ace" a test. It doesn't stop at just extreme studying, either. I hear girls talking all the time about how they use ADD medication to help them lose weight when summer rolls around. ADD Meds decreased appetite due to the slowing down of your metabolism (or so I've heard). With public school budgets shrinking over the years, one-on-one help with students disappearing and classroom sizes growing larger all the time; students inattentive behavior is being blamed for why they are not able to learn as the rest of the class. Five and six year old brains are then subjected to mind-altering, habit forming drugs to help them better focus in the unfavorable learning surroundings thrusted upon them. My generation (born late 80's early 90's) was the first to be given these medications and also the first to be deemed with having "Attention Deficient Disorder". 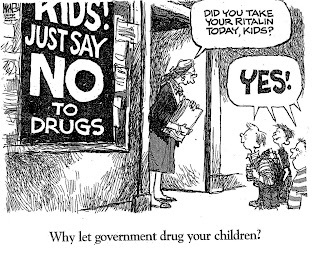 Mostly blamed on changes in society and bad parenting, we were the Guinea Pigs for those to come there after when it came to the treatment of ADD. 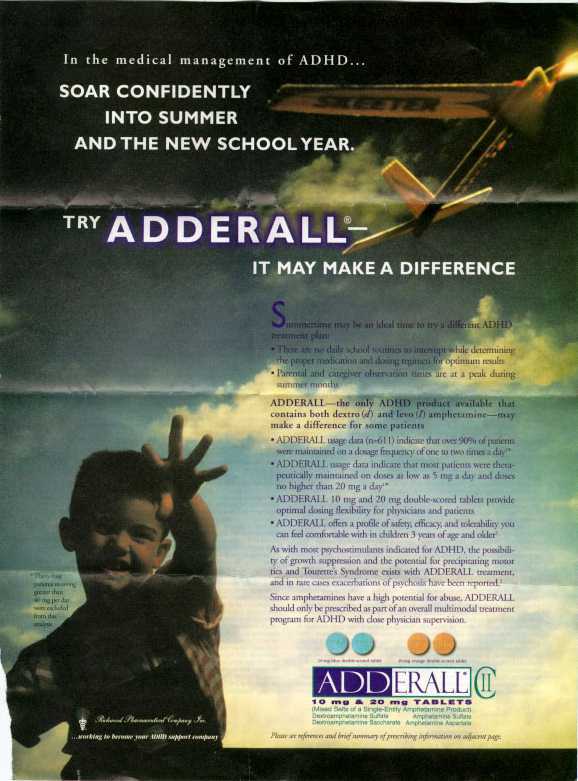 Ritalin was the drug of choice for most doctors when I was young, so naturally when I showed signs of my attention starting to wane, it was prescribed to me. When on this medication I would go from "outgoing and fun loving" to "do my work and sit quietly to myself when I'm done" almost instantly. I can remember thinking how this medication seemed to steal the very essence of who I was right out of me once consumed. I continued taking Ritalin until symptoms of depression began to occur, when I then decided to begin weaning myself off of it throughout High School. When I arrived in College, however, I quickly became overwhelmed and started falling behind in my classes. I decided that some form of medication would be needed if I were to succeed in graduating with a degree and made an appointment to talk with my doctor. My doctor and I decided it would be best if I try a different form of medication only to be taken on an as needed basis. This worked quite well over my college career, so much so that I am now a proud college alumnus. My experiences with these medications have been a "Love/Hate" relationship to say the least, and the process of finding what medications worked for me was a long and winding road. 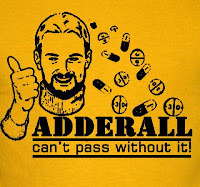 DO Be responsible if you are on ADD medication such as Adderall or Focalin and don't give them away to friends or sell them. These medications are prescribed by a doctor for a reason. They have certain side effects that need to be monitored properly, and if not, may result in injury. No one wants to be held responsible for the injury or even death of a friend. DON'T Take Adderall or ADD medication like it without consulting with your Doctor and acquiring a prescription from them first. Not only is it illegal, but it's extremely dangerous. 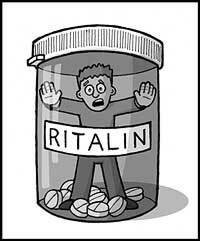 You just don't know how your body is going to react to these types of medications. DON'T Take or buy a medication from anyone in the first place. You can never be 100% sure what it is they are really giving you. If you really think you need some form of ADD medication, consult with our doctor. What I hope you guys, especially college students, get out of this post is that Adderall and medications like it are not just some kind of wonderdrug to help you get good grades and stay thin. These medications, along with most all other things in the universe, come with give and take. In order to GAIN the undivided focus on your work at hand, you have to LOSE a little bit of yourself in the process. These medications don't just effect you physically, they effect who you are as a person; your very mindset that makes you "You". Anything that alters the mind in such a way should always be treated with caution and never taken without doctors approval. You can always retake a class, but you only get ONE Mind.